THE TOWER is the third and final instalment of the fabulous 'Sanctus' trilogy by Simon Toyne. After thoroughly enjoying the previous two books, I have been waiting for this final one with nervous anticipation for the last year. 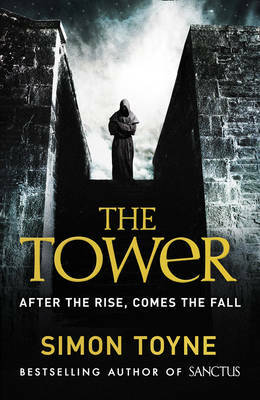 I am delighted to say that I wasn’t disappointed and THE TOWER is by far the best book of the three. I loved it! I wanted to find out what happened at the end so much but am now gutted that I have finished it. Well written, absorbing and gripping, if you like to lose yourself in a good book, then this one is most definitely for you. I am sure you could read THE TOWER on its own, without having read the others, but you are missing out on something really special by doing so. The story continues where it ended in THE KEY: the Sacrament has been returned to Eden and Liv has stayed there as well, for her safety. Her parting gift from the Sacrament is an ability to understand different languages and she can now communicate with the locals, as well as interpret the writing on the Star Map that guided her to Eden at the end of the last book. Gabriel is sick. He was infected with the deadly blight in The Citadel and, in order to save Liv, has left her in the desert, to return to The Citadel and take his disease back to where it came from. If he can survive that long; most infected people die within three days, so his chances don’t look good. The book then switches to eight months later and a serious situation with The Hubble telescope. It appears to have been shut down by someone, or something, and the computers controlling it have frozen. There is a message saying ‘Mankind Must Look No Further’ on the computer screens, along with a mysterious countdown - but nobody knows exactly what is being counted down to. The scientist responsible for Hubble has disappeared, so the FBI, in the form of agents Franklin and Shepherd, is called in to help find him and the truth they uncover will leave you shocked to the core. A very well blended mix of chapters, alternating between eight months ago and the present, fill us in on what happens to Liv and Gabriel at the same time as bringing this fantastic trilogy to its triumphant conclusion at The End of Days - but is it really the end or just the beginning? Now that the excellent Sanctus trilogy is over, we can only sit and wait to see what Simon Toyne will produce for us next. I am sure it will be fantastic!